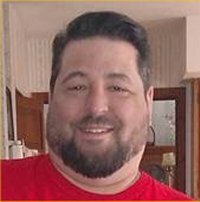 Dustin M. Frischkorn, 38, of Belleville, Illinois, born Friday, January 16, 1981, in Belleville, IL, passed away Thursday, January 17, 2019 at his parent’s house in Belleville, Illinois. Dustin worked as a Service Advisor for Truck Centers in Troy, IL. Services: Celebration of Life will be held from 2:00 to 7:00pm, Monday, January 21, 2019 at the Elk’s, 9480 Old Lincoln Trail, Fairview Hgt, IL. So sorry to hear this , Dustin was a great guy RIP. Brad and Family- So sorry for your loss. From the entire Kaemmerlen Family we are sending prayers and our deepest sympathy to you and your family. So sorry. He had a huge heart. Love you all. Ashley and Andy, So sorry for your loss. Our heart goes out to you and your family. I can’t even express in words how sorry I am for your loss. Dustin was an implemental part of my adolescence and he will not be forgotten. My heart breaks for you. May he Rest In Peace with the other angels. Brad and family. So sorry for your loss may Dustin rest in peace. I’m so sorry for your loss. He was a great dude. Brad my son knew your son as well as all of his friends. I am so sorry to hear of this loss. My heart and prayers go out to all of you. Brad and family sorry for your loss. My family and I are praying for you. With deepest sympathy. The Wells family. My deepest sympathies to the family. You are all in my prayers during the difficult time. I am so very sorry for your loss. Dustin will be greatly missed by all who knew him. My prayers are with the family during this difficult time. We will miss you Dustin…..
To the Frischkorn Family and friends. We are sorry to hear about the loss of Dustin. May he rest in peace. You have our Deepest Sympathy. The Zielinski Family. I am truly for your loss. My prayers are with you and your family. My deepest sympathies for your entire family. To the entire family, I am so sorry about Dustin. My prayers are with you all.